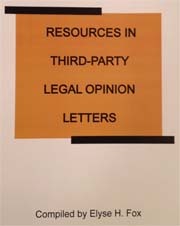 Sources of discussion about third-party opinion letters and sources of actual opinion letters; bar association activities and model opinions; and bibliography. Full description below. 1 copy: $100; 2 copies: $190; 3 copies: $276; 4 copies: $360; 5 copies: $425. Fills in a huge gap in the literature. A go-to resource for librarians, lawyers, and legal researchers. 97 pages. ISBN 978-0-941991-06-7. Compiler: Elyse H. Fox, BA, JD, MSLS. Ms. Fox has worked as a law librarian for 40+ years. She previously practiced law in Chicago and Boston. What is a third-party legal opinion? Kendall Svengalis, Legal Information Buyer’s Guide and Reference Manual; former Rhode Island State Law Librarian.